They're not rocket science (I don't have a keyboard, or ProTools, or... any equipment actually), but some of them turn out to my liking. Often, it's just a case of getting the vocal mix to flow into the dub, without anyone noticing where one stops and the next begins. Sometimes it's trickier. Anyway, I'll be posting a few of my favourites here over the next few weeks. 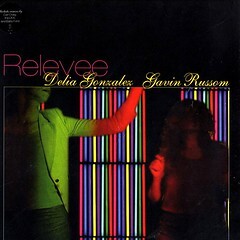 Here's one I've done of Relevee by Delia Gonzalez & Gavin Russom. This was one of the best tracks of last year, but difficult to find on CD in Europe, despite killer remixes (Carl Craig, Baby Ford). Caiman still have it for around $5 (less than four quid in the UK, less than six euros in Europe...). I really like the way the track has been turned from an ever-changing ambient masterpiece into devastating space disco, so I thought it would be great to marry the two. Now it's a 14-minute monster! (albeit with an extremely long introduction). Feel free to tell me what you think, or to send links to films of you dancing like a person possessed. And if your are big fans of the group (there must be some), you can watch them being interviewed - in a big red lift - about, erm, making their own synthesisers. So I suppose they're geeks, but they seem like nice geeks.